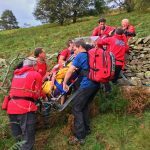 Incident Details: A 45 year old male working with a youth group, twisted his knee near the top of Stake Pass. The rest of the group came down to Langstrath and raised the alarm, leaving the man and a companion in a tent for shelter. Initially this call went to Langdale/Ambleside team, but as it was on the border, both teams responded, and as Keswick were light on numbers because of winter training, Cockermouth MRT were asked to respond as well. In the event, the casualty was able to walk with the aid of a pair of sticks, and was assisted down to Mickleden. Team members were then retrieved from Ambleside base. 11 Team members + 12 LAMRT members + 15 CMRT members – 5 hours 25 minutes.